Big Agnes Seedhouse SL1 backpacking campsite on snow, near Mt Jarvis, alpine tundra, Wrangell – St. Elias National Park and Preserve, Alaska. Please click on the image to view a larger version of the photo. Just a quick snapshot. Here’s a photo from the campsite a day previous to the recent posting of my backcountry campsite. 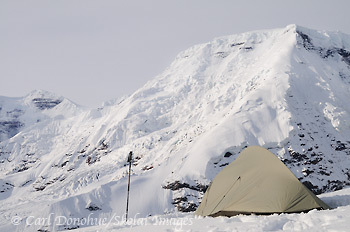 Camped at about 7 200′ ASL in September, in Alaska, snow can be expected. There was a pretty good cover of fresh snow when we arrived at this spot, but we got another good dumping in the few days we were there, So, plenty of snow to go around! 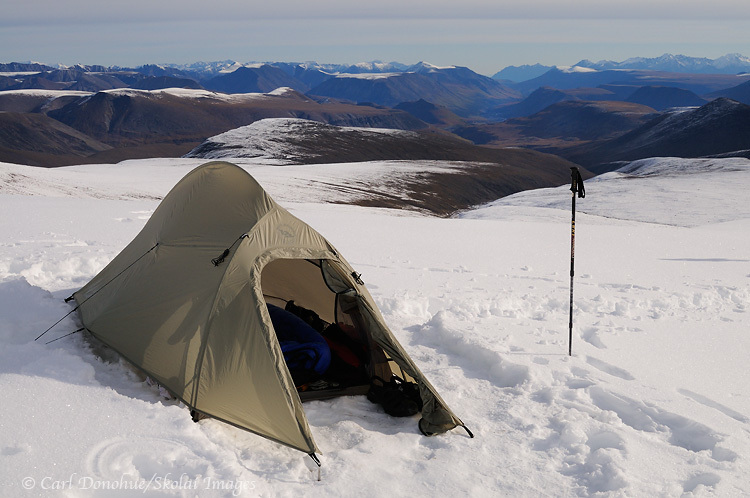 For the record, the Big Agnes Seedhouse SL1 handled the snowfall just fine. Here’s a funky story to go with this campsite. Somehow I contracted Strep throat on this trip. I’m not sure where I got it, and who’s to blame for passing on this nasty little bug to me, but on day 3 of our trip, I didn’t feel so good. Oddly, the symptoms weren’t indicative, to me, of strep; cramping, dehydration, diarrhea, stomach pains, etc. My throat was a little sore, but not really noticeable. I actually wondered if I hadn’t contracted giardia (I’ve never, in nearly 15 years of backcountry travel in Wrangell – St. Elias National Park, contracted giardia). Regardless, there wasn’t too much I could do about it, and the folks on the trip with me were doing just fine, so I had to basically grin and bare it. So stoically, I soldiered on through the trip. 🙂 If you’ve ever wondered how stoicism and diarrhea in the middle of a dark, cold, snowy and windy night in the alpine country of the Wrangell mountains go together, I can regale with you all the sordid details. Let’s just leave it at this; me stumbling, barefoot and pantless, through the snow, trowel and toilet paper in hand, a tiny headlamp lighting the ground in front of me, seeking some form of relief in the wintry darkness. Return to camp, Wait 30 minutes, Repeat. Ughh – what a horrible night that was. So, immediately upon returning to town after the trip, I went to the Doctor. Finding a clinic open at 5pm on a saturday in Alaska is a difficult chore, but I found one. I felt pretty bad by now, after 7 days of infestation, but even I was surprised by what happened next. I signed in, waited 45 minutes, went in to the waiting room, chatted with the nurse while she took my pulse, blood pressure, etc, and then waited for the Doctor. He comes in about 15 minutes later, and asks me some more questions. In the space of about 2 minutes, I began to feel faint, dizzy and completely out of it. Next thing I knew I’m laid back on the table, and the Dr is still talking, but I have no idea about what. I’ve never, previously, blacked out, in my entire life. I guess if one can choose the circumstances under which one might black out, sitting on the patient’s table in front of a Dr is a pretty good choice to make. Anyway, the Dr gives me some water, tells me to rest up, and I end up OK. I get a strep test done, he gives me a prescription for Strep, as well as giardia (just in case) and I’m heading back to the mountains in a day or 2. All’s well that ends well, eh? In nearly 20 years of teaching guitar lessons in a big city to school kids in a studio less than 10’x10′, I never contracted strep throat, ever. Now I spend the summer walking in the mountains with no more than 4 or 5 people at a time, and someone gives me the germ. What a crazy mixed up world, dontcha think? 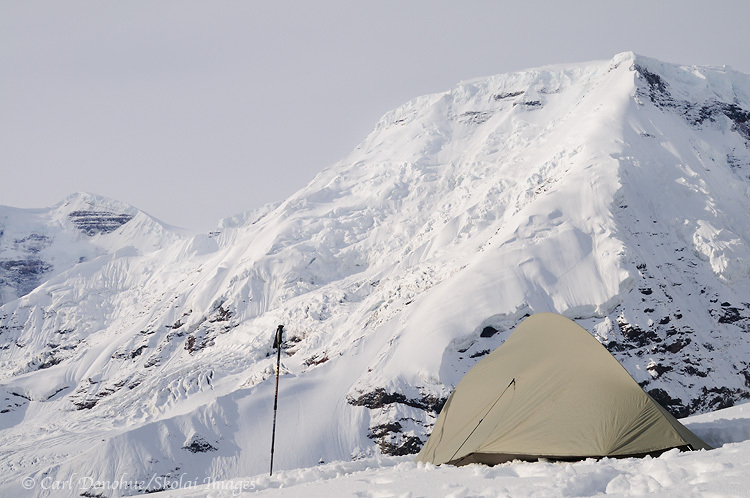 Backcountry campsite, with Big Agnes Seedhouse SL1 tent, facing Mt Jarvis, with fresh snow on the ground, Wrangell – St. Elias National Park and Preserve, Alaska. Click the image above to view a larger version of the photo. This entry was posted in Adventures, Alaska, Backpacking and Hiking, Cool stories, Fall, Landscapes, Musings, Wrangell - St. Elias National Park and tagged Big Agnes Seedhouse SL1, Mt Jarvis, Wrangell - St. Elias National Park on October 11, 2010 by Carl D.
Carl, you were quiet as a mouse sneaking around barefoot and pantless that fateful night. What a thoughtful guide you are! Although it might have been an entertaining sight…you running around pantless. Your a crazy man, Carl! Glad you made it through. Carl, that is awful. I can’t believe you didn’t wake everybody up–I mean, why didn’t you? You know, that’s my worst travel fear, getting sick and not being able to get to a bathroom. But I guess you have learned that the whole WORLD is your bathroom, so it’s no big deal! Ha ha .. It was quite a night, to be sure. Doug – Glad you got the Skyledge – great tent man, you’ll love it. Sleep well. Tracey – I’m not sure how quiet I was. I’m glad you didn’t see the debacle though; I’d NEVER hear the end of that one.